J50 was declared dead Thursday after a search for the whale by boat, plane and from shore failed to spot her. Last seen on Friday, the 3-year-old whale was not with her family on several sightings in local waters around the San Juan Islands, including a superpod gathering Thursday in which some 60 whales from J, K, and L pod were together near Race Rocks. However, J50 was not among them. “This is a sign from the whales that all is not going well out there for recovery of the southern residents,” said Ken Balcomb, of the Center for Whale Research, who declared J50 dead at about 4:30 p.m. Balcomb is the keeper of the demographic data of the critically endangered southern resident population of orca whales, now down to only 74 members. The death of the whale makes moot plans underway for a rescue of J50, which included taking her into temporary captivity for rehabilitation. J50 had a tough life from the start. Always small for her age, she got her name Scarlet from deep rake marks near her dorsal fin, a sign, researchers believe, that she was pulled out of her mother by other whales in a midwifed birth because she was in a breach position. But while always small for her age, scientists became concerned as over the course of 2017 and this year she lost more weight. She became so emaciated it became increasingly hard for her to swim and hold her head up, as the fat pad in her cranium shrank, reducing her buoyancy. The National Oceanic and Atmospheric Administration (NOAA) mounted a progressively more intense effort involving veterinarians and biologists from Canada and the U.S. to save her. Finally this week, the agency announced a plan to capture the whale and take her into temporary captivity for assessment and, if possible, rehabilitation since all efforts to treat her in the wild had failed. The agency said it would act immediately if the whale stranded – turned up on a beach, or was unable to swim. Debate swirled over whether the agency should act, or why it hadn’t acted sooner, and the ethics of such extreme intervention. But it all was too late in the end. 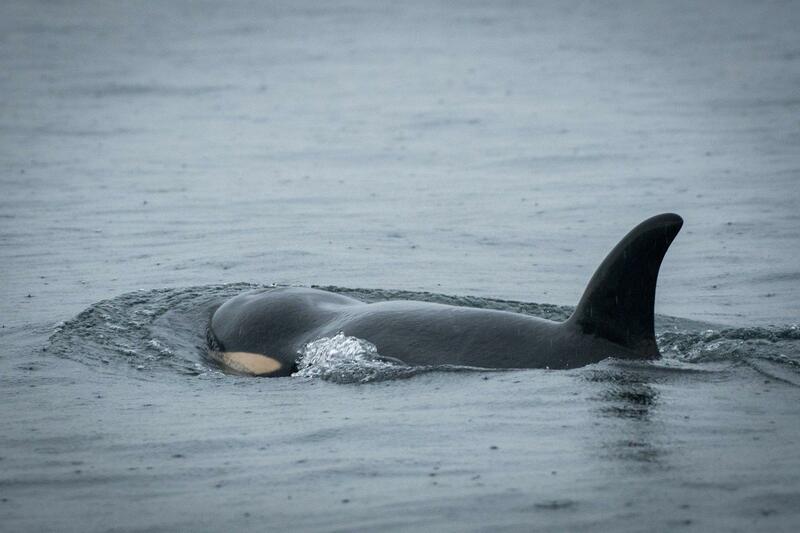 J50 is the second death in the critically endangered family of southern resident orca whales in less than two months. Tahlequah, or J35, brought worldwide sympathy as she swam more than 1,000 miles for 17 days through the trans-boundary waters of the Salish Sea, clinging to her dead calf, which lived for only one-half hour. The southern residents have not had a successful pregnancy in three years. J50 was the first of the “baby boom” among the southern residents that caused so much celebration in late 2014. Of the 11 babies born between December 2014 and Jan 2016, only four are known to still be alive. Biologist Deborah Giles, research scientist for the University of Washington Center for Conservation Biology and research director for the nonprofit Wild Orca, used to often see J50 babysat by her brother, the largest of J pod, with her the smallest. “They were really sweet together,” Giles said. She was a spunky whale with an independent streak, Giles said, spending time off on her own while her family foraged. She also glided along in the slipstream of her mother, J16. “You could see she just wanted to be lifted up all the time; these whales are very playful, they will lift up their calves and toss them, and the calves will swim over their backs,” Giles said. Public meetings held by NOAA to hear concerns and thoughts from the public about southern resident killer whale recovery are still on schedule for this weekend, including one at Friday Harbor at the high school Saturday at 7 p.m. and at the University of Washington Haggett Hall Cascade Room on Sunday at 1 p.m. Published: Sept. 6, 2018, 1:10 p.m. Updated: Sept. 13, 2018, 5:58 p.m.